It was record turnout for this year’s Charities Supper held on Jan 16th. If you were there, then you know that this was once again a very successful event and we must again thank Jon Moulton for his generous financial support, enabling us to have over 50 guests from charities present. A full house of 130 guests enjoyed the evening, the excellent surroundings, some great food (which I thought was particularly good this year) and terrific wines selected, as ever, by our Wine Club. 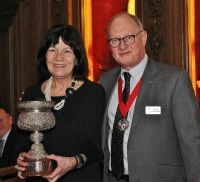 As ever, the evening was a celebration of our ProBono work, compèred by the Committee Chairman, Patrick Chapman and the revelry started with the award of the Matheson Cup by the ProBono Committee to a member of the Company who has "gone above and beyond". This year the cup was presented to Gia Campari for her outstanding multilingual client support, especially to the YBI accreditation process over many years and several continents. Congratulations Gia! Mark Bixter – General Manager at Magic Me, an arts charity that brings the generations together to build a stronger, safer community. As an example of what that means in practice, Mark told us about “Cocktails in Care Homes”, which sounded good to me (and indeed everyone there)! 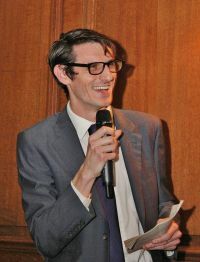 Mark also paid tribute to Liveryman Malcolm Green who has been bringing his financial management and spreadsheet modelling skills to bear for the benefit of the charity. 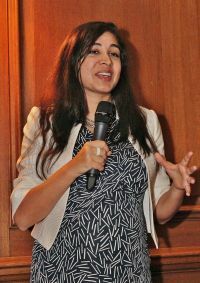 Shireen Irani – a partner at Fieldfisher and the Founder and Executive Director of iProbono which is a platform for civic engagement, which aims to amplify the voices of civil society and defend human rights. It operates globally and harnesses technology to mobilise its network of lawyers and students for the public good. The charity has volunteers from major law firms and in-house corporate legal functions. Shireen expressed her thanks to the Master, John Corneille, and Freeman Tom Jenkins for their considerable ProBono support in getting iProbono off the ground. As a result of this work we now have an informal relationship between WCoMC and iProbono, where we can cross-refer ProBono requests, which will increase our joint capabilities to support client organisations. I thought between them these speakers gave a good representation of the wide range of work we do across the not for profit sector and the impact our volunteers have on the organisations they work with. The ProBono Committee express here a big thank you to all those involved in the planning and preparation for this event, including the Clerk and her team, the Wine Club and all those involved making the evening such a success. And finally, the greatest vote of thanks must go to our Volunteers, our members who continue to give their time energy and expertise for the benefit of not for profit organisations. Our sincere thanks to them, one and all. Next Year: The date for next year’s Charities Supper has yet to be finalised but you can be sure we’ll tell you about it very soon, right here. One Digital is a consortium of five organisations (Age UK, Clarion Futures, Citizens Online, Digital Unite and the Scottish Council of Voluntary Organisations (SCVO)) that are working in partnership to help people develop the digital skills they need to benefit from being online. At the heart of One Digital is the recruitment and training of Digital Champions to deliver essential digital skills support to individuals who are digitally excluded: 4.3 million adults in the UK have no essential digital skills at all. People who do not have essential digital skills can find themselves at a disadvantage when engaging with public services, managing their finances, finding a job or keeping in touch with loved ones. Simon Engwell has been advising them on both strategy for growth and fundraising mechanisms. The work is on-going. Ataxia UK is a patients’ group working with all of those affected by the condition (i.e. patients and families/friends) to fund research into cures and treatments; improve treatment and care; and raise awareness of the Ataxias: a set of rare life-limiting, degenerative, neurological conditions affecting co-ordination and mobility for which there are no cures. Rhonda Best did a concise review of their finance processes with the aim of providing an assessment of the resources required to run the finance function efficiently and providing recommendations on any automation which could be utilised to streamline their work, particularly linking through to their income and fundraising department. This is an example of our new client assignment model where one member of the ProBono Committee provides oversight and guidance to the volunteer providing the client support. This is an example of how short-term involvement can lead to longer term relationships, which happens a lot. Volunteering Matters is a large national charity that develops and delivers high impact volunteer-led solutions in response to some of the most difficult challenges facing individuals and their communities today. Volunteering Matters engages more than 23,000 volunteers and 115,000 beneficiaries every year through more than 100 active programmes across the UK. I got involved in Jan 2018, helping to organise and facilitate a Board workshop, which went well. By the Spring of 2018 I was back helping with further workshops as the Charity faced some significant financial management challenges. I ended up acting at their Interim Finance Director right through the summer and I’m pleased to report that all the challenges were overcome. You just never know what a ProBono Assignment might lead to. The next ProBono evening event is now scheduled for 25th April at Cass Business School. Please put the date for this evening "workshop" in your diaries. We are planning to focus on income generation - a subject that is high on every charity's agenda at the moment. The guest speakers will be advised shortly. Under the continued leadership of David Glassman and Nanette Young, we have been developing our ProBono mentoring capability, and we are delighted that many members of the Company have responded to Charities’ needs and requests for support. Demand is building again, with seven new requests for mentoring support in the last 12 months. "I joined the Company in 2002 after stepping out of the Telecoms sector and becoming an independent consultant. 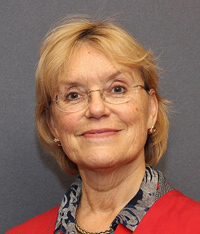 Convinced that the Company would be a great place to socialise with like-minded people, I was rapidly persuaded by Gordon Stoker to begin mentoring and by John McLean Fox to take up a pro bono assignment and not long after joined the Charities committee. The Company founded the Centre for Charity Effectiveness at Cass Business School at the end of 2004 and I was recruited part-time (but working full-time) to set up the Consultancy and Leadership Development practice. I retired from that role at Cass in 2016, probably the longest pro bono assignment in the Company as well as being the longest serving Pro bono Committee member! During my time at Cass CCE I graduated with an MSc in Voluntary Sector Management. My latest pro bono assignment was with YMCA England utilising my expertise in federated charities, the subject of my dissertation. 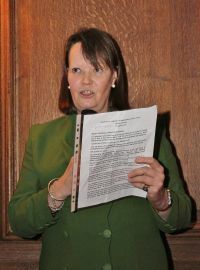 I am still employed part-time on the MSc programme at Cass CCE, I am CEO of the Honorary Treasurers Forum, Treasurer of our own Charitable Fund and Area Minister for the Third Order of the Society of St Francis in Berkshire. Semi-retirement gave me more time to participate in Company affairs and I have been enjoying the progression to First Warden of the Company." Thank you as ever for reading this far. 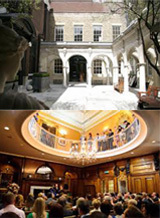 We hope to see you at the New Members’ Reception on 19th March.